Dental implants are ideal for restoring beauty, and functionality to a patient’s smile without the need for bridge work or other procedures. Implants are surgically placed underneath the gum line and fuse naturally with the bone, acting as an abutment for crowns and even dentures to sit on top. 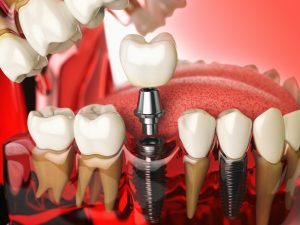 We here at Ascent Dental Group can help with your implant procedure as well as implant removal, if it is needed. Dental implants are a replacement for the root of a tooth. Implants are metal titanium rods that are surgically placed underneath the gum line and into the bone. These rods are lightweight and extremely durable. After a few months, the implant will fuse naturally with the bone and will act as an anchor for crowns, bridge work and other appliances. Dental implants serve many purposes but one of the most important ones is that a dental implant helps to maintain the jawbone’s shape and density. When teeth are lost or removed the bone that supported those teeth are lost too. A dental implant allows for the space to remain as if a natural tooth were still in its place, causing the facial skeleton, gum tissues, cheeks, and lips to remain in-tact instead of caving in. Dental Implants look and function just as your real teeth. You can eat, chew, talk, and smile without the worry of your implant being noticed. You have a severely infected tooth that needs to be pulled. You have a loose bridge that is causing pain. You want a more permanent solution instead of bridges or crowns. What is the procedure to get a Dental Implant? Receiving a dental implant is a multistep procedure that can take several months to complete. Once the initial consultation has occurred and our dentists have created an individualized plan for you, the implant post will be surgically placed into your jawbone. Because this is a much larger procedure than most, you will be sedated, which means you will need to have someone drive you to your appointment and take you home. The effects of the medication will last for a little while, so it is best to not drive or travel, and no strenuous lifting. Once the procedure has begun our highly trained dentists at Ascent Dental Group will make an incision into your gumline and the jawbone below is exposed. The dentist will use a specialized tool to drill into your bone socket where the missing tooth is, and the titanium post will be placed. If bone graft is needed it will be placed at this time. Once this part of the procedure is over the dental implant will naturally fuse to your bone and anchor the metal post securely to the bone. This can take several weeks to fuse together. Once the titanium implant has fused with your natural bone, a second visit will occur and an abutment, or a small connector post, is attached to the top of the implant. This will allow the implant to securely hold the crown, and function as if it were your natural tooth. You will have impressions or 3-D renderings made, which will be sent off to create a crown based off your impressions or 3-D renderings. The final stages of adding your permanent crown will be fitting and smoothing it out on your tooth and permanently sealed with dental cement. It is important to take care of your new implant with proper hygiene and care and regular visits to the dental office. When is Implant Removal necessary? If you would like to inquire more about dental implants or want to have one removed, contact Ascent Dental Group today and one of our helpful staff members will be happy to assist you!